The first time we met Robert we were hauling a refrigerator over to his new home. He and his boys live in a trailer park in Flint and you could see the pride on his face when we entered his new home with his new refrigerator. Robert came into our lives through our friend Chris, who has a passion to not only meet people but also grow a relationship with them. Robert and his sons, Albert and Juan, were at Wal-Mart in Flint looking for glasses at the same time as Chris. It was a simple conversation that sparked a friendship with their family. For weeks Chris told us to talk to Robert and hear his story and finally we got the chance to come and hear about his life. For the second time we found ourselves in Robert’s home, this time we brought pizza and pop for him and his boys. We were settling ourselves in to hear a good story and what we got was an amazing and unexpectedly honest look into his life. Surrounded by his boys, his neighbor, her daughter, Chris and the two of us he told his story. It was a nice change to see someone surrounded by his family as he shared with us about his life. He spoke quietly from his chair and spoke to us like we were old friends. Robert’s view of life has changed dramatically throughout his lifetime. But one thing that is undeniable is that he and his two sons have an amazing story to tell. Robert has experienced a life of mourning, hardship, crime, drugs, love and a life-threatening disease. But as we sat down with Robert and his family, we knew that did not define him. The Robert that sat in front of us had a love for God and his sons were his world. He wanted them to learn from everything he had gone through and accomplish whatever they set their minds to. He was born on June 14, 1981 in Shelby, Michigan. Robert had 10 brothers and four sisters. His parents were migrant workers, so as soon as he and his siblings were old enough to work in the fields and pick apples, they did. In 1989, Robert’s dad was diagnosed with ALS, a disease of the nerve cells in the brain and spinal cord that control voluntary muscle movement. Basically it’s a nervous system shut down. His dad was told he had four years to live – something Robert was told himself later in life. On Nov. 15, 1994 Robert’s dad passed away. “I had anger, frustration. My family just fell apart,” Robert said. “I had to grow up fast. I was becoming somebody I wasn’t supposed to be. I was the adult. He was “daddy’s little boy,” Robert said. He helped take care of him and protect him through his illness. Between the ages of 12 and 18, Robert’s life was spent in either a juvenile detention facility or in prison. When Robert went to jail, he had 30 felonies and 35 misdemeanors. He did a lot of drugs and sold them while he was in jail. Robert admitted to stabbing people and trying to kill others. When Robert got out of jail, he got married. Soon after he had two sons – Albert, now 13, and Juan, now 12. The marriage was far from perfect. Verbal abuse, infidelity and physical violence were normal occurrences. On one instance Robert recalled telling his boys to go outside, and after they did he covered himself and his wife in gasoline. He was going to light them both on fire but as he tried to get the lighter started, his wife pushed them both into the shower and turned on the water. As the water began to fall the lighter lit but was extinguished. In March of 2007 Robert was diagnosed with ALS, the same disease that took his dad’s life. He was told he would have four years to live. It was then that he realized life wasn’t something to waste. His ALS was getting worse. His marriage was falling apart and he would often find himself on the floor having seizures. Robert’s young boys would be the ones to take care of him, just like Robert took care of his dad. Feb. 7, 2009 was a day that changed everything. His illness took control and Robert was transported to a hospital where he died for five minutes. It could only be a miracle that brought him back, Robert said. “When I got diagnosed everything changed,” Robert said. And the day he died was a day he became a different man. He was baptized shortly after and wanted to live a better life. He was still having a hard time walking, some days not walking at all. And he was having multiple seizures a day. Robert kept his faith in God, he said. Albert and Juan have been with Robert for the past two years. But before that they were apart for five years. After leaving his wife, Robert went out of state to North Carolina before returning back to Michigan. 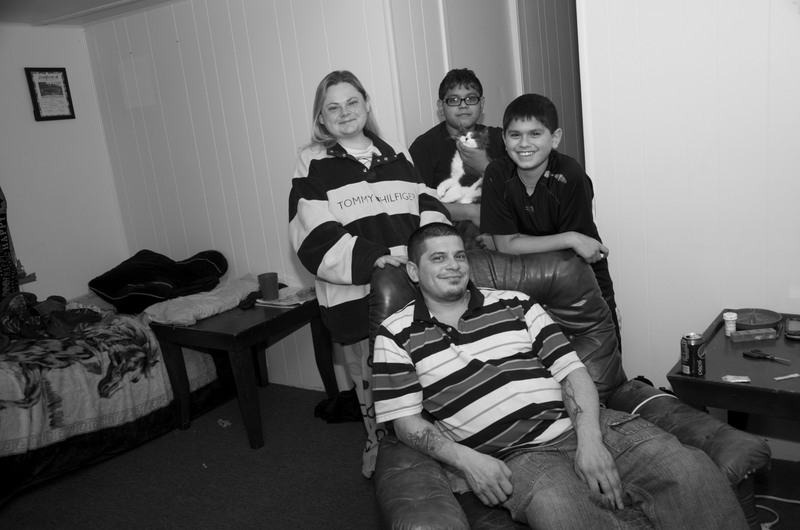 In March of 2011, Robert and his boys moved to Flint in the trailer park he lives today. Flint had the doctors Robert needed. He was taken care of. While they were apart, there were times when Albert would be locked out of his mom’s house for days at a time and Juan was mistreated on a regular basis. When their mother didn’t want them anymore, Robert got them back. And the boys wouldn’t want it any other way. “I do everything for my boys. I never had a childhood,” Robert said. “That’s why I try to teach my kids … (life) is not easy. It’s not a game out there. You have to learn how to survive. Robert’s time in Flint has been a journey in itself. He found a place to live in a trailer park in Flint with a girlfriend. On Nov. 4, 2012 Robert and his boys were kicked out with no place to go. He prayed to God, he said, asking him where he should go. He thought about the motel next to the trailer park, but that was not a place he wanted to raise his children in. “They call it a crack hotel where there’s a bunch of drug dealers, drunks and prostitution,” Robert said. But without hesitation, Robert’s neighbor and friend, Jeanie, took the family in and helped them in any way she could. On Dec. 3, Robert was blessed with an open trailer in the same park for a good price. “Since I’ve been here in Flint it’s been good. I thank God,” Robert said. The whole family has been welcomed at a nearby church, which surprised Robert. His body is covered in tattoos, and through his eyes he looks a little different. The boys are involved in youth group and the family has been blessed by the people who are now in their lives. Robert has good days and he has bad days. But every day is spent with his kids. Recently nurses told Robert he may only have months to live. He has a feeding tube and walks with a cane. Some days he gets around in a motorized scooter. His speech can slur from time to time. After all he’s been through in his life, Robert hopes his boys will learn from his mistakes and his actions and live life knowing what’s important. Most of the time when we leave an interview we leave wondering what will happen next to the person we just talked with. Often they are glad they had someone to talk with but they still have little hope that things in their lives are going to change. Many people accept the way things are and learn to live with it. Robert is different. He has a long and difficult road ahead of him but he is facing it with joy. His joy is not in his circumstances but in his faith and the people he surrounds himself with. We will continue to update you on Robert’s journey with ALS. Thank you for reading his story.